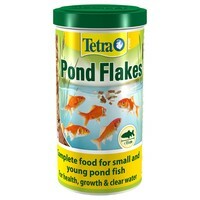 Tetra Pond Flakes is complete flake food for all small pond fish. Feed TetraPond Flakes 2-4 times a day (depending on the temperature), feeding only as much as the fish will consume within a few minutes. Once large enough, move your fish onto a Tetra Pond stick or pellet diet.